I have wanted to make my Ford Mustang 2013 GT look more aggressive for awhile now. Want a meaner front end, but was afraid to look those iconic GT fog lights and the traditional running pony. 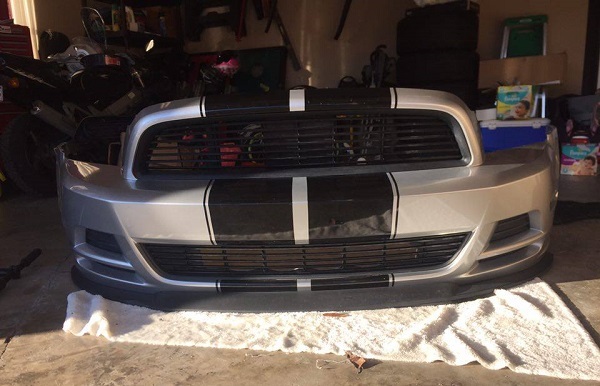 I am talking about my idea with a friend one day and it really inspired me to do the upper and lower grille with no pony and have the fog lights hidden behind the grille. Later that day I saw on Facebook that somebody was selling that grille style that I needed to achieve the look I wanted. I messaged the fellow Mustang owner and made a deal and he shipped it out to met the next day. The grille was the stock grille off his 2014 CS/GT convertible. 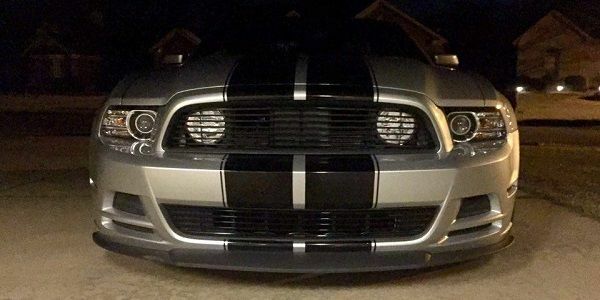 After I received the grille I realized I was going to have to move my Ford Mustang's fog lights inward to make them visible behind the grille. But after doing some research and reading on some Mustang forums, I came up with an idea. I decided I could cut the plastic inside corners off of the grille so that my fog lights could remain in place on the outside corners. I then decided since I was going to have my bumper off, this would be a good time to install some Raxiom halo fog lights as well. 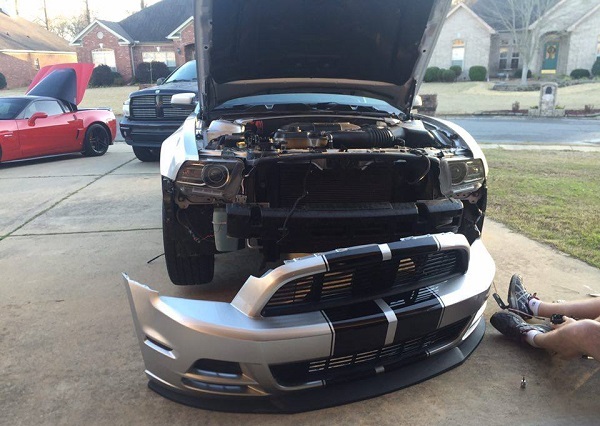 Once I received my fog lights I messaged a friend to come over and help me with the process. We decided a dermal tool would work best for customizing the grille to work how I wanted it too. I was super nervous at first and it was my first time using a dermal tool. But the result came out perfect! 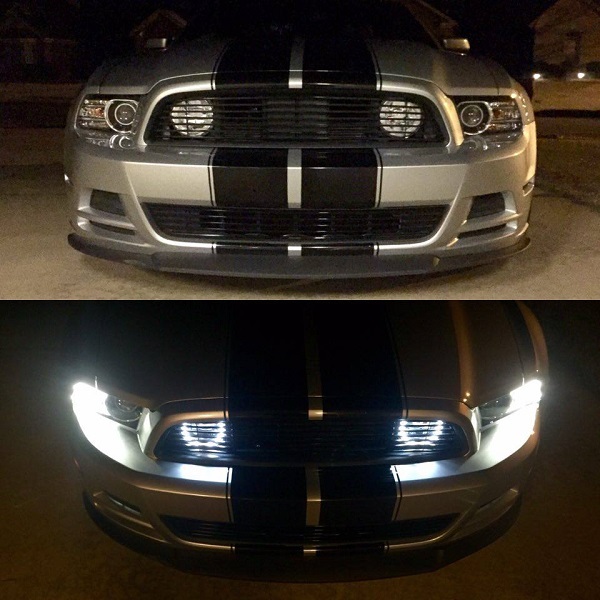 We installed the halo fog lights and the new upper and lower grille into my bumper. Everything went back together well and I was shocked with how different my front end looks. My Ford Mustang 2013 GT now has a much more aggressive look! I can still see the iconic GT fog lights through the grille. I will admit, I do miss the running pony on the grille but plan to keep the original one off my stock grille for sentimental reasons. Here is me at work. Here is my Ford Mustang before and after. I don't understand - the before and after look the same except one has the lights on. I think your car looks great. 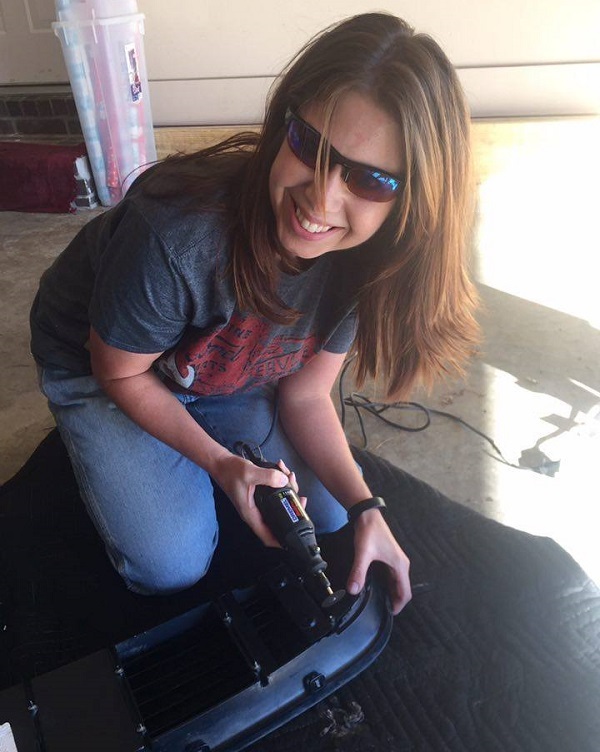 I Don't want to sound sexist, but it's great to see a woman who loves cars as much as i do. Great that you did the work yourself. Enjoy your car.